Last week we headed off to Cornwall with our Bumble Camper van! Having caught the road trip bug in Australia with our Lucky camper, we were super excited to try the UK version. 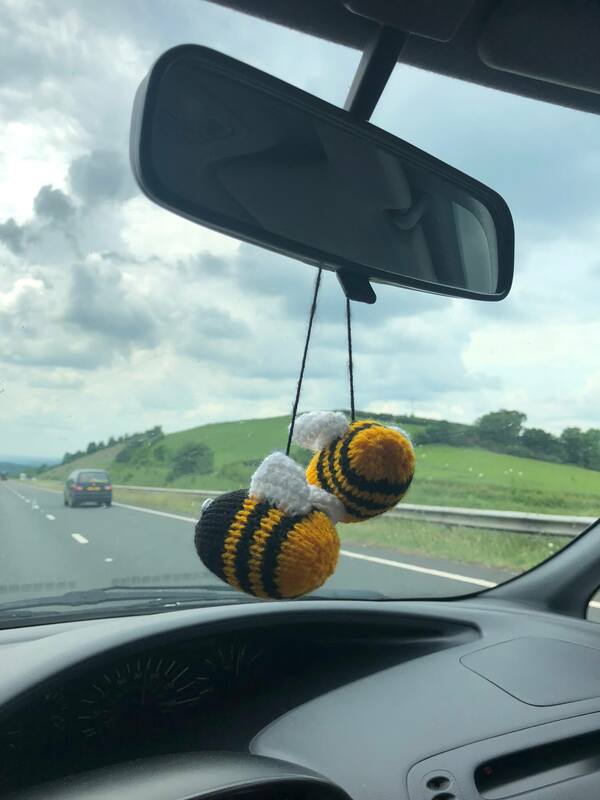 Bumble Campers have two pick up points – one in Manchester (perfect for visiting the Lake District!) and one in Peterborough. I picked ours up from Manchester and when I arrived they surprised me with an upgrade to a really swish camper which even had a roof tent. It looked huge and so I was a little worried about driving it but I needn’t have been. It was an automatic and, although it was bigger than what I’m used to driving (a Ford KA in case you’re wondering), it was super easy to drive. 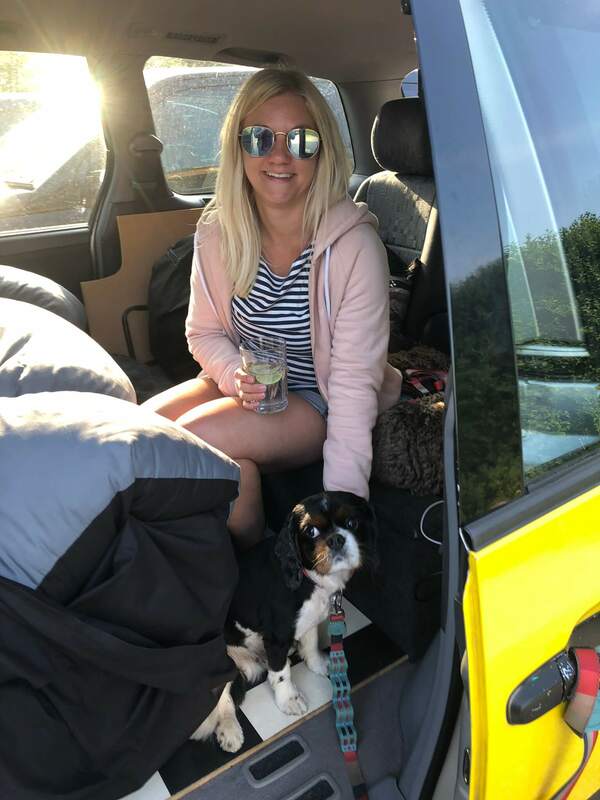 After picking up the camper the night before, we filled it with all our luggage, strapped the dog in and headed off on our adventure to Cornwall. Oh yes, did I mention that Bumble Campers are dog friendly? I absolutely fell in love with Cornwall when we visited last year and so we decided that this summer we would stay in the UK and explore more of it, making the most of the summer that we get here, and then going further afield to get some winter sun next year (watch this space to see how that pans out!). This time we were headed to Boswinger, just outside of St Austell for a few days followed by a couple more days in Falmouth. The drive down was five hours long but it was really comfortable – the driver’s seat as an armrest and everything – and we actually enjoyed it. 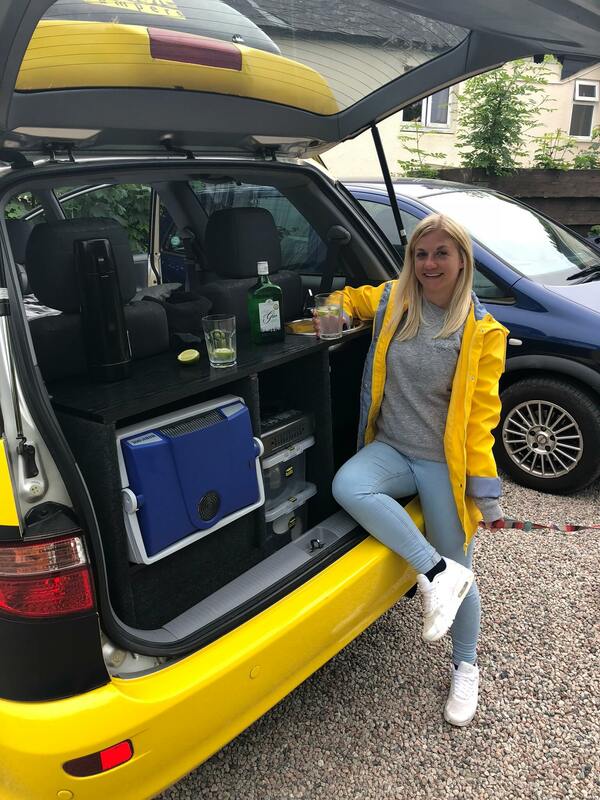 The camper was really well kitted out with everything we needed for the journey – there are cup holders in the front, large pockets in both doors and a USB and aux cable for listening to music from your phone. Oh, and the vans are bright yellow, so you’re really noticeable on the motorway! On arrival we parked up at YHA Boswinger where we parked for the next three nights. We chose to park at a Youth Hostel so that we could make use of the self-catering and bathroom facilities there, but there are hundreds of campsites around Cornwall where you can park your van for the night and there are plenty of wild camping spots too, if you’re a little more adventurous. We needn’t have worried about the self-catering facilities as the camper van is fully equipped with a camping stove, all the pots and pans you need, a table and two camping chairs so you can sit inside or outside your van while you’re eating. There’s also a fridge to keep all your food and drinks cool and this plugs into a leisure battery, rather than the car battery, so you can leave it plugged in, even when you’re not driving. The leisure battery then charges while you drive. There are a number of good rotomolded coolers that can be used in your camping adventure which can be found at a site like NOMVDIST.com, which my friend used before her camping trip. YHA Boswinger is a five minute walk from a quiet, rugged beach, so we walked down to there when we arrived and had a walk on the beach. Unfortunately the weather wasn’t amazing while we were there (although we didn’t have rain!) but this beach would have been incredible on a really sunny day. One thing that I love about Cornwall is the stunning coastline and this did not disappoint. We needed to drive the camper van every day whilst we were staying in Boswinger, so we had to make the bed and put it away every day. This wasn’t a huge pain, as it was really easy to do and everything was designed to fit really well into the space. If you prefer to leave the downstairs as your sitting/eating area, you can sleep in the tent on the roof. We didn’t bother with this as we’re lazy and we used the van every day for driving, but this extra space means that the van can actually sleep four people. There are four seats as well, which was perfect for driving Alfie around, as we could strap him in. Night times were our favourite, as we turned the “kitchen” area of the camper van into a bar where we served gin and tonics straight from the fridge with fresh limes. We watched beautiful sunsets, then as it got cooler, got snuggled up in bed to watch the things we’d downloaded onto Netflix. It was so relaxed, we really enjoyed it. 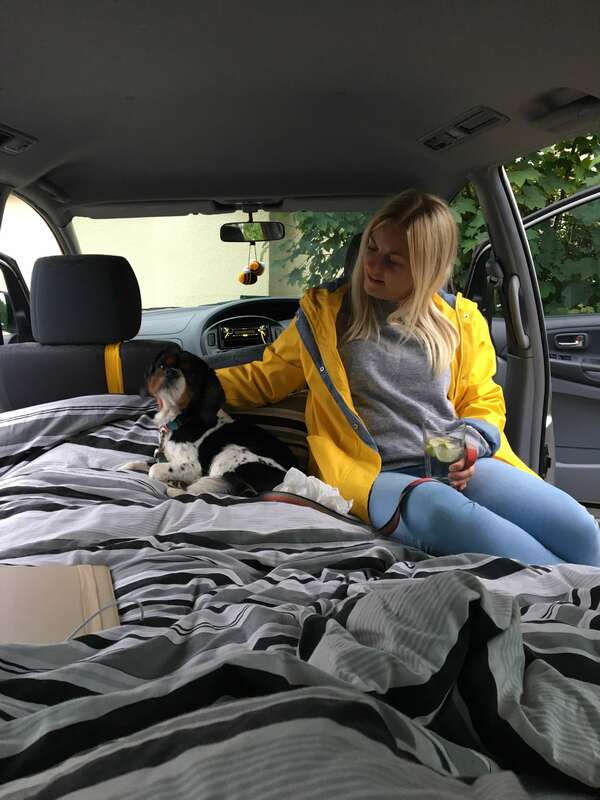 Sleeping in the camper van was really comfy as the mattress was really thick – even Alfie slept through the night! 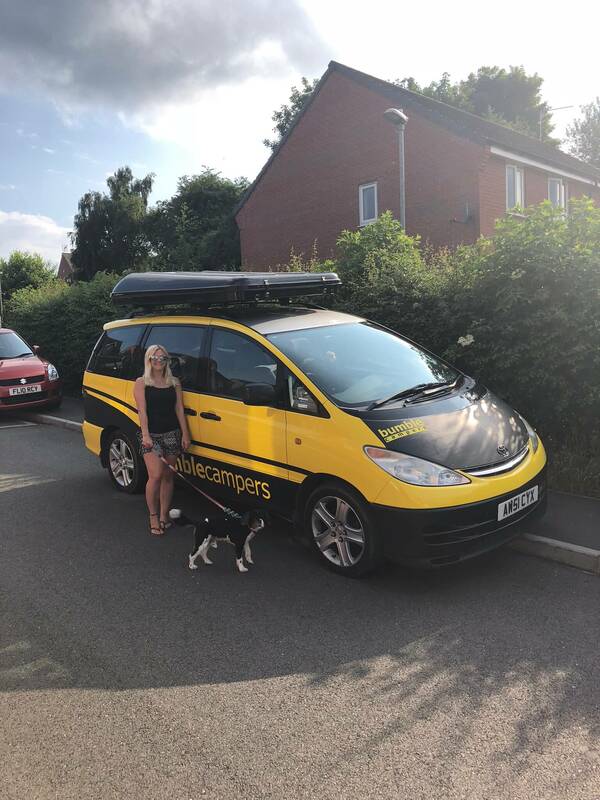 Our Bumble camper van really made our holiday and we would definitely recommend a camper van holiday to anyone. We loved it so much that we’re even considering buying our own van and converting it into a camper! If we did, we would consider using One Sure Insurance to protect it as they offer a great price and flexible benefits to suit us. I love the freedom of just parking up and sleeping somewhere and then packing up the van the next day and our Bumble Camper really did have everything we needed for the holiday. Have you been on a camper van holiday before? Let us know in the comments!